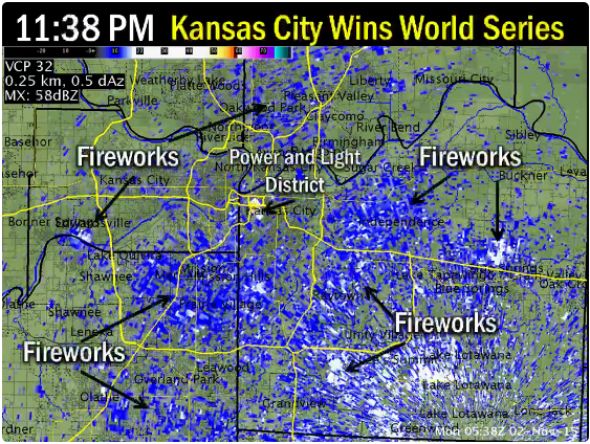 Royals World Series win captured on Kansas City radar. The moment the Royals won the World Series—a celebration 30 years in the making. Kansas City has been waiting a long time for this. As a lifelong Kansas City Royals fan (seriously, my childhood bathroom was sponge-painted blue and gold) and weather nerd, this is just too perfect. Occasionally, when it’s not raining, weather radar can pick up some interesting things. Last year, for example, I wrote about an enormous mayfly hatch showing up on weather radar along the upper Mississippi River in Wisconsin. In places like Texas and California, smoke from wildfires also routinely shows up on radar. These special views are possible when radars switch to what’s called “clear air mode”: the tracking beam slows down, enabling the radar to become thousands of times more sensitive and allowing particles as small as soot to become detectable. Since the smoke plume from a fireworks explosion is really, really small compared with a forest fire, it usually takes a lot of people setting off fireworks at the same time for them to show up. New Year’s Eve in New York City, that sort of thing. Or, your favorite baseball team winning the World Series for the first time in a generation. That’ll do it too.